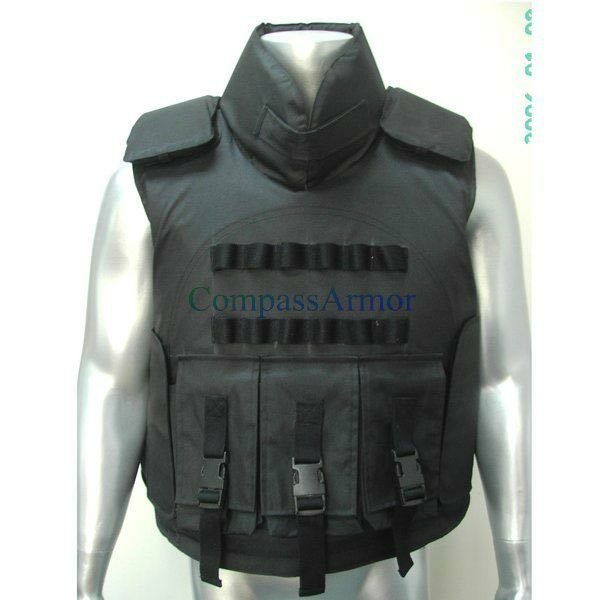 We are a counted among the eminent Manufacturers, Suppliers and Exporters of various Bulletproof Vests/Jackets from China. The U.N. Tactical Bulletproof Jackets we make available come with additional protection for the collar, shoulder and groin. The inner material of the Bulletproof Jackets is lightweight and breathable. Buyers are free to place bulk orders of Bulletproof Jackets with us and we ensure their timely execution. One can obtain the Jackets at competitive rates. Overview : The Compass Armor UN Tactical vest/jacket offers a lightweight body armor but with extended protective coverage during peace keeping missions. We use a heavyweight UN Blue or Black outer fabric and a lightweight and breathable inner material to improve comfort. Additional protection of the collar, shoulder and groin are also provided. The collar protector can be folded down to improve wearer comfort during periods of low threat. Plate pockets to incorporate 10x12 inches (250x300mm) hard armor plates are fitted as standard. In addition ammunition pockets are fitted to the front of the vest. These can be modified to suit particular equipment you may carry. BALLISTIC SERIES : We offer 3 different ballistic series, which make use of different ballistic fabrics and configurations to meet different price and weight targets. Series A is the most competitively priced ballistic series and Series C the most expensive. Colors : Black, Blue, Olive Green, Woodland Camo, Desert Camo, U.N. Blue, etc. Besides the standard sizes, we can also accommodate special measure requirements to provide optimum comfort for the wearer. In accordance with NIJ Standard 0101.06 (July 2008).